The Home Depot Foundation today joined with The Mission Continues and multi-platinum rock band 3 Doors Down to launch its “Celebration of Service” campaign, a major effort to enhance the lives of U.S. military veterans. The campaign, which officially begins on September 11 and runs through Veterans Day, November 11, 2011, includes 200 service projects directly aimed at improving homes, facilities and community centers where veterans live and receive services. Today’s announcement was made at a service project in Los Angeles, which has the nation’s largest population of homeless veterans. The Home Depot associates, veterans working with The Mission Continues and band members volunteered together to make repairs and upgrades at New Directions, Inc.‘s residential facility, a nonprofit program that provides housing, job training and other services to almost 600 homeless veterans each year, many of whom are recovering from “invisible illnesses” including substance abuse, mental illness and post traumatic stress disorder (PTSD). By the end of the day, the volunteers will have completely refurbished the outside gathering area where veterans’ families come to visit them when they begin the family reunification process – creating a small corner of comfort and normalcy as they work to recover and rebuild their lives. 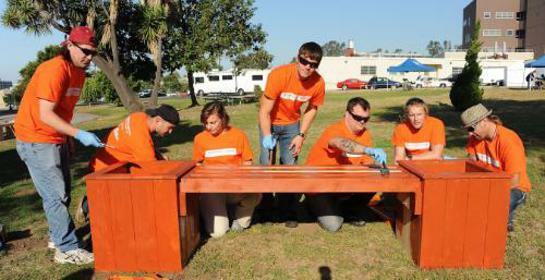 Follow The Home Depot Foundation on Facebook and Twitter (@homedepotfdn) to see video and photos from the day. In addition, The Home Depot Foundation will donate more than $9 million in grants to nearly 30 nonprofit organizations serving veterans during the Celebration of Service campaign. $1 million in grants will be announced each Monday morning via Twitter and Facebook, and will also be featured on The Home Depot Foundation’s website at www.homedepotfoundation.org. “The Home Depot Foundation is committed to ensuring that every veteran has a safe place to call home, and we intend to improve the lives and living conditions of thousands of veterans across the country during our Celebration of Service campaign,” said Kelly Caffarelli, president, The Home Depot Foundation. The “Celebration of Service” campaign is also offering an opportunity for veterans to use their leadership skills to get involved in their local communities through The Mission Continues, an organization that encourages and supports every veteran to serve again as a citizen leader. Customers can also contribute by purchasing a Celebration of Service themed gift card from The Home Depot between September 11 and Veterans Day. Five percent of the value placed on these cards, available both in-store and online, will be donated to The Home Depot Foundation to support nonprofit organizations serving the housing needs of veterans. Beginning September 11, the new album “Time of My Life” by 3 Doors Down, whose music has inspired and comforted veterans, active duty troops and their families for many years, will be available online at www.homedepotfoundation.org/celebrationofservice. For each CD sold on the website, the band will donate $1 to The Home Depot Foundation to directly support veterans’ housing initiatives.